The initial reaction from your salespeople will typically be one of uh-ohh, what are we going to have to do now? Don’t we have enough busy work to do? There is even possibly some resentment, which is fairly typical when you introduce anything new to a sales floor. Sometimes there is also the natural reaction that some people do not want you to know the true traffic counts and their personal closing ratios. They might not understand that this is a tool, which will create dramatic benefits for them personally. It will immediately help them provide better customer service and support and will very quickly help them close more sales and make more money. 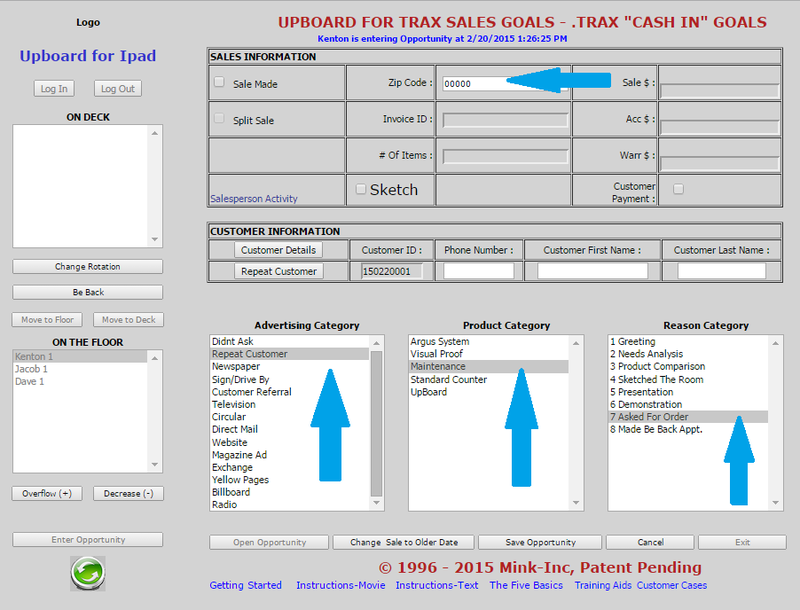 The goal of TRAX is to increase the revenue for each salesperson by a minimum of $5,000 per month, every month while simultaneously improving advertising performance, and reducing advertising costs. # Salespeople X $5,000-$10,000 X 12 months = $________ (Big Bucks). A key ingredient to getting off on the right foot is asking your salespeople to sign the Salespersons Agreement included in this package. If you do not have copies sent to you from TRAX then please email us at support@traxsales.com and we will send it to you. This document lets the sales team know that you are serious about improvement in your company. If you receive resistance from an individual about signing this document you need to find out why and resolve this issue. The key point we want to make at this time is that when introducing the system for the first time it should be pointed out how fast the system is to use, and so easy to learn, a child could do it. Begin the TRAX introduction meeting by asking which one of your salespeople dislikes computers the most? Which salesperson is the most intimidated by, afraid of computers, or just doesn’t care for them at all? Whoever wins this discussion is the person you select to do this 5-10 minute exercise. It is very important that you do not touch the mouse to assist this person through these steps. 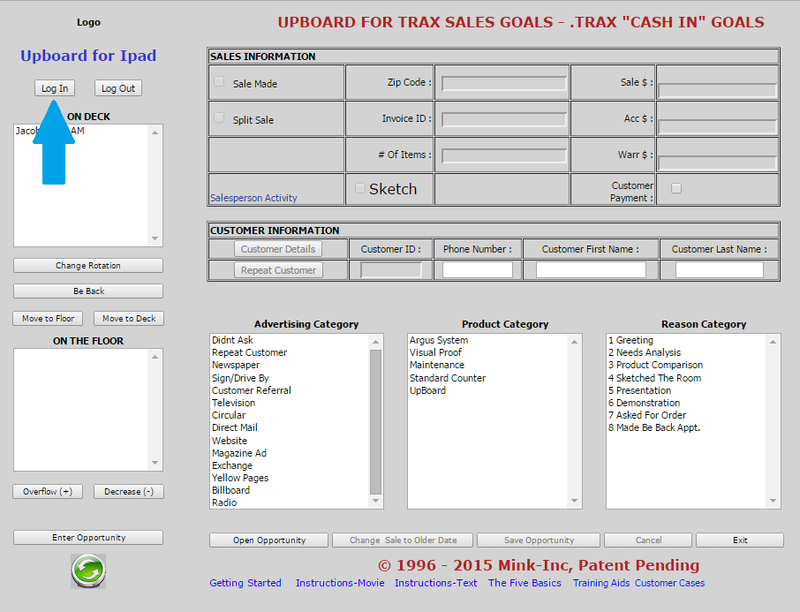 If done correctly it should be fast and fun, and clearly demonstrate that TRAX is very easy to use. First of all ask this salesperson to move the mouse over the Log In button (top left) and click once. Then select three salespeople by left clicking once and selecting OK. This is also a time clock and provides a complete time sheet and several management statistics such as average time with customers and average sales per hour. After these salespeople are all “On Deck” let’s assume that three customers came in. Ask your student to move all three salespeople’s names to “On The Floor” highlighting the salespersons name then selecting the Move To Floor button. In other words we are assuming that each salesperson is on the sales floor working with a prospective customer. After a customer leaves, (This is the patented part) in order for the salesperson to get back into rotation they must answer four simple questions. First select the Enter Opportunity button (lower left); making sure the proper salesperson is highlighted. Let’s assume this first customer didn’t even speak to us. They came through the showroom grunted a few times stopped for 20 seconds at a product and touched it once, and left. The customer is always right but sometimes we can’t even get to first base, and that’s ok. It happens. 1. Because we didn’t get any information from this customer we need to put five zero’s in for the zip code. (Of course if you have a salesperson that enters zeros all the time you need to have a coaching session). 2. Let’s assume we noticed a newspaper ad in their hand so the next thing we do is select newspaper on the advertising list. 3. They stopped at a particular product so select the product that matches. 4. And finally select how far they got in the selling process? In This case we never got past the Greeting so select that. Each one of these final selections is done with a single click, which changes the color of the selected item to blue. After this is done select Save Opportunity on the bottom task bar. That’s it, once a salesperson gets used to the location of things it only takes 5-10 seconds to enter this information so they can get back in rotation. Ask your student to please select Enter Opportunity and let’s assume this second salesperson made a nice sale. The customer has left and the salesperson is ready to get back on the UpBoard. Select the Sale Button on the top left. And answer the four basic questions. 1. What was the zip? 3. What brought them in? 4. What did they buy? the Salesperson DB module if they want to follow up later. Select Save Opportunity on the bottom task bar. Please note that you have the option to track several more things. Invoice number, items per sale, accessory sales, and warranties compared to sales. For the purposes of this initial introduction we suggest that you keep it simple and only ask for the basics to be done. That’s it, I like to make a big deal about how easy and fast this is. 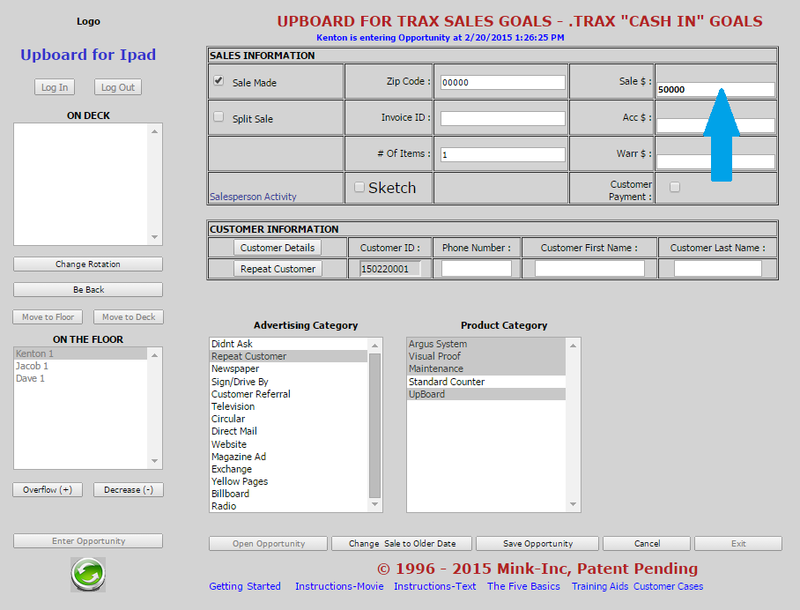 This is the fun part that will immediately demonstrate the powerful benefits of TRAXsales to your salespeople. This customer loves your company and the salesperson. They are closing on their house in two weeks and tell you that they will be back in on a specific date, or ask you to follow-up on the 15th of the month and they will bring their husband in and select the right color. 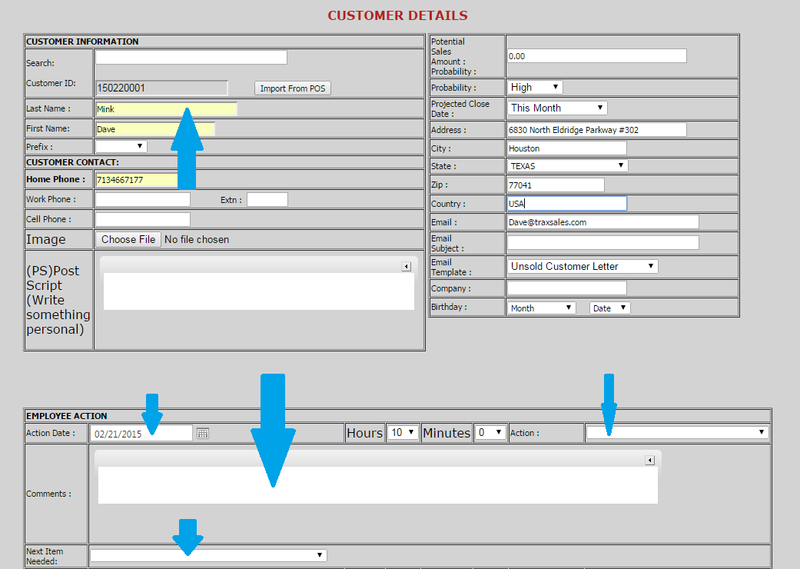 Select the Enter Opportunity button (lower left) then click the Customer Details button (top left). Ask the salesperson to fill in the blanks. Just put in their name a fake address and telephone numbers. For the home phone enter 10 numbers including area code. You do not need to put in brackets or spaces, just the 10 digits. The most important thing here is the Action Date. Have them select the double hearts and select a date on this calendar. This date will be the morning that this reminder will be automatically emailed for each salesperson along with a master for the manager. It’s just like providing each salesperson with their own personal secretary, and I suggest you tell them so. They will never miss another opportunity again or have a promise broken because they misplaced a customer information card or as some currently use a Post It Note. After they select OK on the customer information card, please notice that the zip code is automatically entered. Your student still needs to answer three more questions. 1. What brought them in? 2. What product category were they interested in? 3. How far did they get in the selling process? That is the complete introductory session. Make sure you ask them if they have any questions, and let them play with it for a while so each can get the hang of it. The final part of this process is insuring that at the end of the day all sales are entered into the system. This insures that your reports and goals comparisons are 100% accurate. Please select on the center left of the UpBoard. This brings up all of the activity for the day up to the second. You may also change the date ranges and analyze each salespersons activity over long periods if you like. This report provides the number of sales and the total dollar volume generated for that day. These numbers should match your actual sales written or you immediately know there is a sale missing. You must find out which one was forgotten and enter it. Please also notice the other benefits this report provides. It tracks the time spent with each customer, the product category interested in and how far they got in the selling process. It also provides the most important money making secret in retail that the multi-million dollar sales professions don’t want everyone to know. 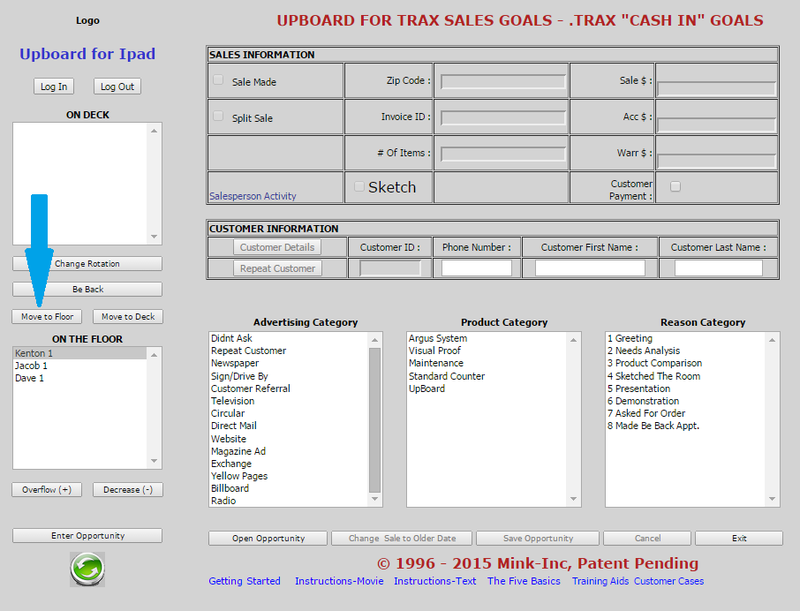 If you email me at Dave@traxsales.com I will tell you all about it. This is a great coaching tool because you can easily sort by salesperson over a month or quarter and learn a great deal about their strengths and weaknesses so you can help them improve. If you find that you are missing a sale from a previous day, you obviously want to enter it for the correct day. 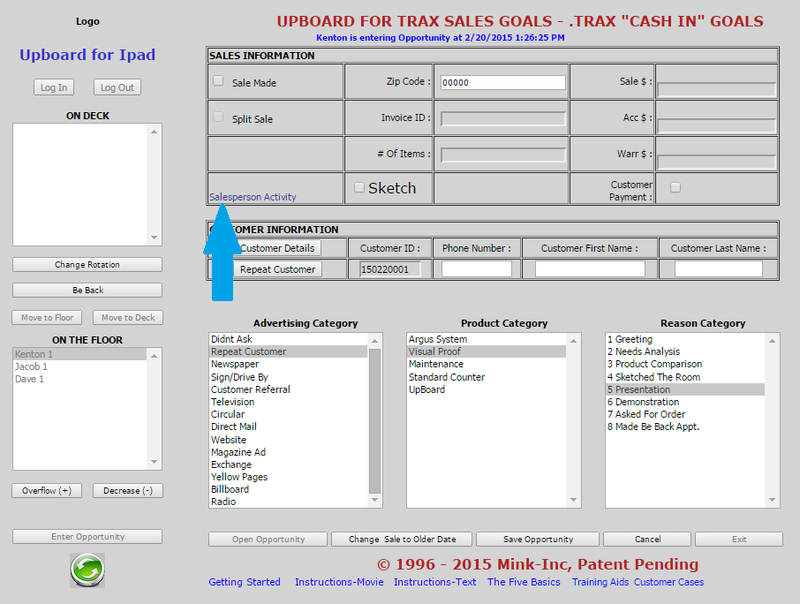 After you have selected the correct salesperson select then select the on the lower task bar. This new window will permit you to enter that transaction on any older date. There are many more features and reports that will interest you but as far as the salespeople are concerned this is all they need to know at this point. A question that always comes up is what happens when you are over run with customers (more customers than salespeople)? The traffic counter is capturing the statistics on how often this happens and for how long, so the most important thing here is to take care of the customer. If you have a prospective customer standing behind you with an open checkbook, you would be absolutely crazy to be playing around with a computer. Our advice is to write up all sales and get the information on unsold opportunities on your customer profile card…(we have customized this for you. If you do not have this important tool call 713.466.7177 and we customize and send it to you). Then after the dust settles and the customers have gone enter them into TRAX at your leisure. What about entering customers from a networked computer? On a fast track or busy day the salespeople should answer at least the four basic questions on the main UpBoard to get back in rotation and should also enter the customers last name only into TRAX. 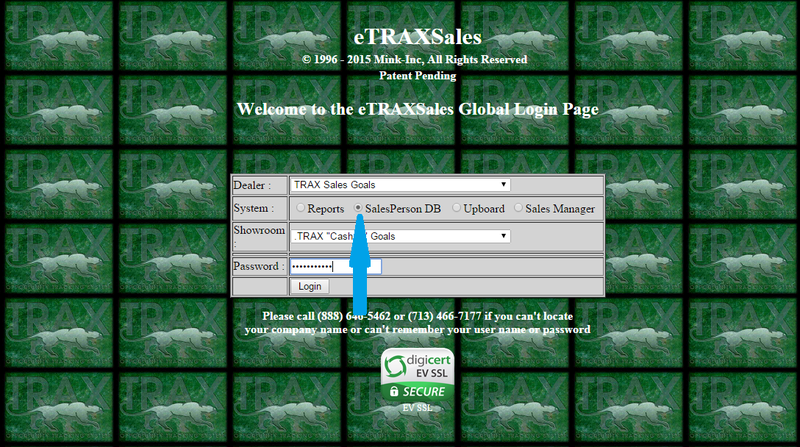 This will permit them to easily go back and add the rest of the customer information for follow-up at a later time from their personal web site eTRAXsales.com, . A very important tool that allows all salespeople to have secure access to only their customer database on line. Please access this through eTRAX reports and the password is set up by you in Reports under in the Administration Section. The gives each salesperson access to only their customer information both sold and unsold. They are able to edit all customers easily and set up follow-up activities such as Action Dates and Automatic Mailing. They will be able to send every customer in their personal database a thank you, special invitation or company news flash with a couple simple clicks. The beauty of this feature is that with this tool there should never be a bottleneck at the UpBoard because they are doing all this activity from a remote computer on the network. They can even send the customer an email with a picture of the exact product the customer just looked at. Encourage your salespeople to enter several fictitious customers. They should be very comfortable with how everything works and most importantly how the action date works. It must be crystal clear that changing the action date to the date you want is the key to automatic follow-ups and reminders. We strongly urge you to ask all sales associates to enter all of their hot prospects they are currently working with. The first day they make a sale because TRAX helped them follow-up with a customer they probably would not have sold in the past is the day you will not be able to take the system away from them. The key is to encourage them to put every prospective customer they talk with into the system. 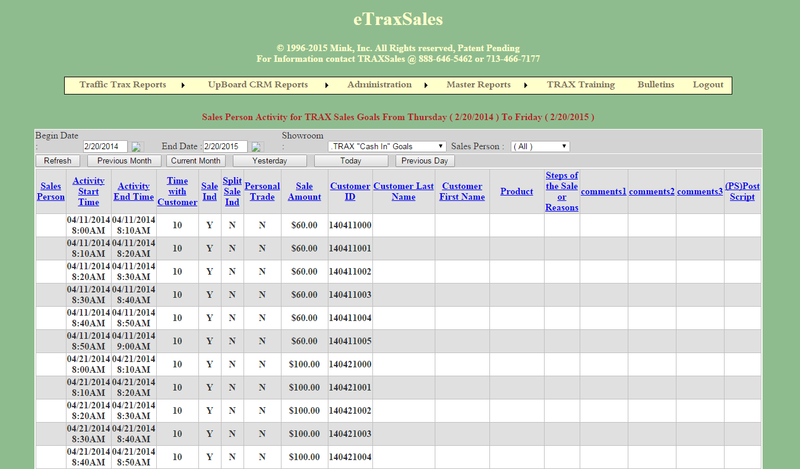 Go to the eTRAXsales.com Reports then Administration. About 2/3 of the way down the list select Daily Activity Report. This allows you to change an incorrect price, add a forgotten number or completely delete a transaction. At the end of each month you should use the Daily Activity Report to insure total accuracy of all categories. You are permitted to edit items per sale, warranties, and more. We have also added a personal password protected DAR for each of your salespeople in their personal Salesperson DB Module. This is easily done but is a top-secret management function. This is located Under and is under . To insure the highest level of success we urge you to have each salesperson provide you a detailed list of all their current hot prospects. You should then ask someone who knows how to type to enter all of these unsold but good sales leads into the TRAX system. If a salesperson has been with you for more than a few months and cannot give you at least 15-20 good prospects they are currently working with, they are not maximizing their time on the sales floor. Some of the time if a good customer absolutely cannot buy today, it is easy to get a customers name and phone number, especially if they trust and like you. If you have a question about any of this information please call us before you introduce it to your associates. Our number is 713.466.7177 where I and my technical support staff are on hand Monday through Friday 9:00AM – 5:30PM central time. For your convenience we also forward these calls on weekends, so please do not hesitate to leave a message. After your sales people have used the system for a couple weeks and have good sales activity and you are ready, we will follow-up with you. Just to make sure you understand all the benefits this new information will provide you. We have also learned the hard way that you are very busy and just don’t have time to search for the reports that might be important to you. This is why we automatically email the reports we feel are critical. This is easy to set up, go to then the fifth one down is just enter the emails you want to send to and at 4AM we send you the reports you select. You may also select other reports and also turn off those reports you do not want. My advice is to leave them alone for the first 30 days. I would like to speak with you at your convenience to insure that you do not have any questions and that you are taking full advantage of all tools available. We look forward to working with you, and look forward to a long and mutually beneficial relationship with you and your fine company. Finally I have a favor to ask. If you want to take a five minute survey and tell us what you think and if TRAX is creating additional success for you making your sales teams more money we want to hear about it. Especially if we have helped you break any sales records. If you do the survey for us we will give your company an extra three months of maintenance at no charge for your traffic counters. The phone number is 281.823.9911 and we look forward to hearing from you.